An electrolyte is a substance that contains ions (charged particles) and is capable of conducting electricity. Most often this is a solution containing dissolved ions, like an aqueous solution of sodium chloride (which contains Na+ and Cl− ions). The presence of ions in the solution is what makes it capable of conducting electricity. It’s for this reason that it can be dangerous to get the electrical outlet wet when drying your hair in the bathroom. Pure water itself doesn’t conduct electricity, but in practice, there are almost always some ions present, making tap water an electrolyte. Another place electrolytes are important is in living things. Fluids in the human body, and in other organisms, contain free ions and are thus electrolytes. Gradients in ion concentrations in cellular fluids are often important for regulating cellular processes and bodily functions such as muscle and nerve activity. 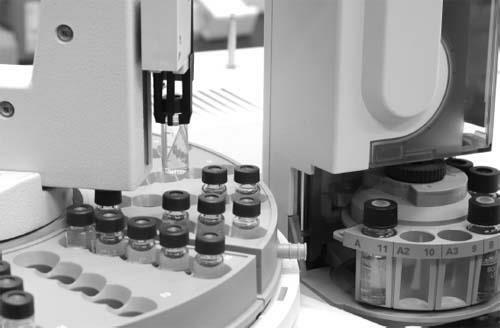 An autosampler selects a sample to be separated by gas chromatography, one of several types of chromatography techniques.